http://m.nzherald.co.nz/aviation/news/article.cfm?c_id=556&objectid=11610521 The first flight to Auckland by budget carrier AirAsia X flight has landed, starting a service that will substantially boost capacity to the Gold Coast and on the airline's home base, Malaysia. Flight D7 206 landed at about 4.12pm marking a return to this country after flying to Christchurch for about a year in 2011-12. The flight was delayed leaving the Gold Coast by a passport processing problem that affected all Australian airports. Auckland Airport has estimated the new AirAsia X daily services will be worth about $176 million to the economy. The airline is Southeast Asia's biggest budget carrier and is using an A330-300 aircraft on the route with a seating capacity of 377. That's a little below the Airbus' maximum of around 400 seats for regional flights. The configuration will be AirAsia X's standard configuration of 365 economy seats and 12 premium flatbed seats. 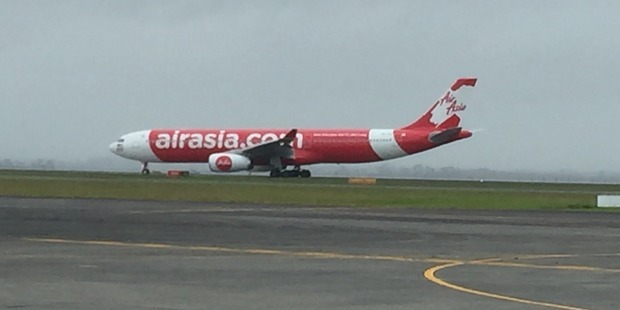 AirAsia X's network covers Southeast Asia, North Asia, India, Australia and now New Zealand. Its key hubs are in Kuala Lumpur, Singapore, Jakarta, Bali, Bangkok, Delhi, Bengaluru, Manila and Tokyo. This will provide more choice for New Zealanders travelling to those destinations and capacity for tourists from Malaysia, India and Indonesia, markets which are growing rapidly. Over the past year 34,000 visitors from Malaysia, 41,000 from India and 18,000 from Indonesia came to New Zealand. The airline flew to Christchurch from Malaysia for about a year but quit the service following the 2011 earthquakes, blaming sagging demand at a time fuel prices were going up sharply. AirAsia has, like other airlines, taken advantage of relatively low fuel prices during the past year to expand to new destinations. The airline launched with $99 promotional economy fares from Auckland to the Gold Coast and $249 to Kuala Lumpur with travel agents predicting the increase in capacity will keep a lid on prices to both destinations. The Gold Coast-Auckland route is currently served with 20 weekly narrowbody flights, including eight from Jetstar, seven from Virgin Australia and five from Air New Zealand, Capa Centre of Aviation says. They offer about 7000 weekly seats on the route but capacity varies depending on the time of year. AirAsia is the latest airline to come to New Zealand and existing carriers are piling on new capacity to serve a travel boom in what's being called a new golden age in air travel. International capacity through Auckland Airport has grown by close to 10 per cent in the past five years as Kiwis travel overseas in record numbers - up 6 per cent last year to about 2.4 million - and the number of overseas visitors hits new highs, now above 3 million a year. According to figures supplied to the Ministry of Transport, there will be close to a million extra seats in and out of New Zealand this year. Around the world, air travel increased 6.5 per cent last year, when more than 3.5 billion passengers were carried. As much as half the increase in passengers is estimated to have been driven by falling fares. Newer PostCould this plane stop you getting jetlag?